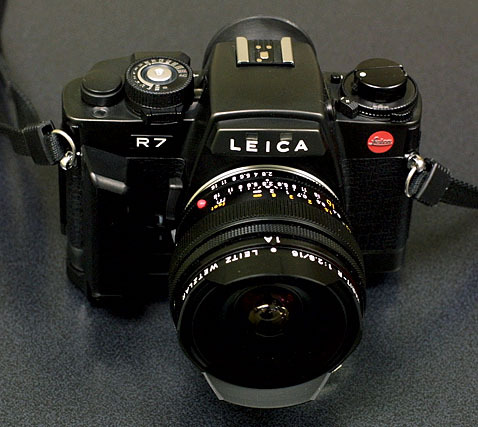 This is the only fisheye lens available amongst Leica-R lenses which fills a whole frame unlike circular fisheye lens. Possible application can be a confined space such as cockpit of the plane. 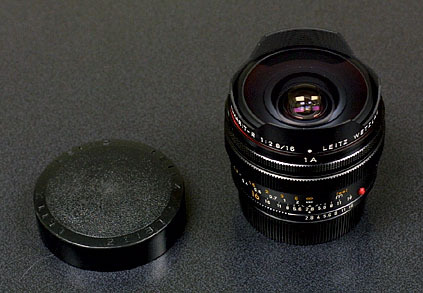 This is a specialist's lens, however it is a magic lens even for the general application with its special perspective as far as proper control is taken. Built-in filters of 1A, 80B, O56, Y48 and the lenshood is just vestigial. Out fit is just simple, Lenscap # 14089 which is also a lenscap for the Hologon-M ! 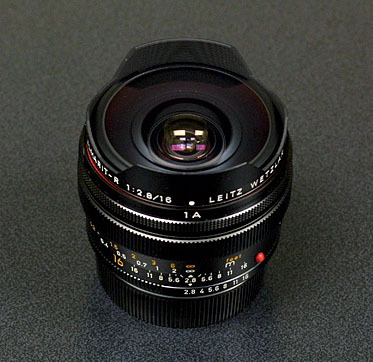 This is a lens made in Japan. Right picture is a construction of MC Fisheye Rokkor 16mm/f2.8, left picture is the same of Fisheye-Elmarit-R 16mm/f2.8. Presumably Minolta is still producing it.